I have been consulting for a company involved in the alternative health “negative ion bracelet” business. I’ve also been working with them to produce a silicone bracelet for my own company (ironically called Dangerous Things) that has an RFID tag embedded inside. I chose to work with this company because I liked their style of wristbands, not because I’m interested in the “ion bracelet” (aka “power balance”) industry. That said, there are several companies in the business of developing and selling silicone wristbands that are “infused with negative ion producing minerals”. Black colored wristbands can apparently contain more of these minerals because the color is unaffected by adding higher concentrations. After I received samples of my own black colored bracelets with RFID tags embedded in them, I began to wonder about this “healthy ion” concept and researched the industry. I was skeptical regarding claims that negative ions actually improve health, but my concern centered around the fact that youtube is filled with videos of people testing various bracelets from multiple companies using an “ion tester”, which presumably tests for the number of ions being produced by the bracelet. Different bands made by different companies actually produced different results, and the ion tester unit shown in various videos is an actual legitimate testing device made by a reputable company. At first I was puzzled as to how a silicone wristband could actually be producing ions without any mechanical action or power source (like a battery), but I quickly came to the conclusion that the only way a silicone wristband could generate ions in the air around it would be through the use of radioactive materials which produced ionizing radiation (x-rays, gamma rays, alpha particles, and beta particles… the bad kind of radiation). Aside from not being licensed to sell products which contain radioactive materials in the US, I pointed out specifically that paragraph 1 contains two provisions the industry as a whole is not complying with; 1) The total effective dose must not exceed 1mSv per year, but these wristbands I had produced approximately 33.2mSv per year, and 2) proper disposal guidelines for radioactive materials were not likely being followed by consumers when they disposed of old wristbands. Here are the two videos I sent to the company CEO and creative director. This first video explains exactly what kind of radiation I’m talking about, what ions are, and how they could possibly be produced by the “natural ion generating minerals” being mixed into their silicone wristbands. I was a bit tired at the time I recorded the video, so I made a couple mistakes, which I corrected later using video annotations (on screen captions). The second video is a short shot of another test done with that same sample wristband, only with the wristband coiled up so the entire band would fit inside the detector window. This shot shows a stabilized reading of around 3.8uSv/hr. Along with these videos, I conveyed my concerns to the CEO and creative director via conference call. They were both shocked and resisted the idea at first, but eventually came to understand the situation. The company is now verifying my findings and committed to shutting down the product line or drastically modifying it so their wristbands are no longer radioactive. I was happy they were committed to rectifying the situation, but my personal concerns center around the industry as a whole. In total, a person wearing a typical black wristband day and night would receive about 33.288mSv in a year’s time. According to this dosage chart, the international standard maximum allowed exposure is 50mSv per year, but this is the limit for people who work around radioactive materials, not the general public (which includes children and infants). 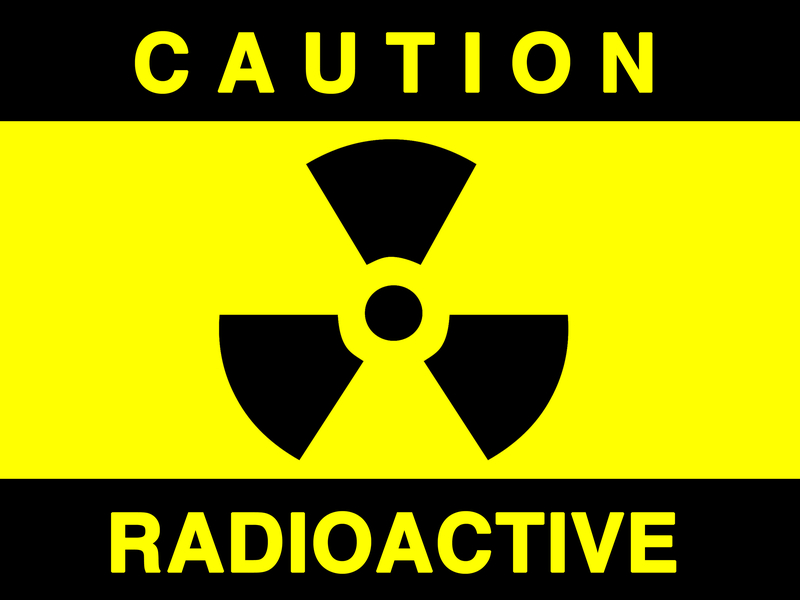 If a person were to wear two or more of these products, they would be well over the 50mSv annual exposure limit set for radiological workers (people who work with or around radioactive materials or devices). The industry is unregulated, and competition to produce wristbands and other products that produce higher and higher ion output will drive ionizing radiation levels emitted by these products higher and higher. The environmental impact of improper disposal of this radioactive material may pose a serious problem. There are several companies producing “negative ion” products, and it’s not just wristbands. There are “scalar energy pendants” that claim to produce negative ions, and other such wearable “healing products”. If the product does in-fact produce negative ions without the use of a power source of some kind, then the only way for it to do so would be through the inclusion of radioactive materials that emit ionizing radiation. The higher the consistently testable ion count, the more radioactive the product is likely to be. Israel has apparently already warned their people about the dangers of these wristbands and banned the sale of them in Israel. So far I have contacted the US Nuclear Regulatory Commission, as well as the Canadian Nuclear Safety Commission. I have also submitted several news tips to various media outlets. Please share this post with anyone you know who has or might use these kinds of products. This entry was posted on Saturday, January 4th, 2014 at 3:11 am	and is filed under Personal Health. You can follow any responses to this entry through the RSS 2.0 feed. You can leave a response, or trackback from your own site. Hopefully companies like this can be reigned in despite the culture of deregulation some large corporations are creating. You said you were concerned about the industry as whole; would you consider testing more of these “negative ion” devices? Check out this chart, the yearly radiation you receive from one of these bracelets is equivalent to the radiation you receive from your general background radiation (From the Sun, the ground, electronics, bananas) in 3 days. While any amount of radiation in an item designed for consumers is unacceptable, if you DO own one of these items, you’ll probably be fine. @Chris if you or anyone else would like to send me wristbands to test, I’d gladly test them and post results. Please contact me and I’ll send you my mailing address. @Kaeg I agree, if you own one of these bracelets (the specific bracelet I tested), you’d probably be fine… however there is an unregulated sea of bracelets out there from a multitude of manufacturers, some of which may contain far more radioactive materials than the bracelet I tested. Also, I don’t understand your background/sun/bananas comparison. According to the chart you referenced, a banana exposes you to 0.1uSv worth of radiation, while this wristband puts out 3.8uSv per hour. That’d be like trying to choke down 38 bananas every hour, or close to 1000 bananas every day (912 to be exact). I own I trion Z band and work in the nuclear industry. Last week a brief went out that an operator set of a hand Monitor. Turns out it was his ionising band. (tests were done and was found to contain Th-136)The make was ‘i-ons’ I think. I’ve been wearing a trion Z one for about a year so I tested it with a dp6 frisk probe and it’sgiving out about 10cps beta/gamna.. I have since searched the net this is the only site I have found. Nothing on Amazon or any of the sites where they are sold points out anything about them… DEFO NOT GOOD..